Will Serbia's Vucic resign over the anti-governmental protests? Thousands of protesters surrounded the residence of Serbia’s President Aleksandar Vucic on Sunday as they stepped up their demands for greater media freedom and new elections. Demonstrators have been staging rallies every weekend for more than three months. On Saturday they stormed the headquarters of state television. "Serbia will not allow threats of violence by anyone," President Vucic said. "Anyone who thinks that they can get political results by hooliganism, violence, attacks on people, physical attacks on people, they are mistaken, " he added. Vucic derided the opposition as "fascists, hooligans and thieves." "I don't want to talk to fascist leaders like Bosko Obradovic. I don't want to talk. As you can see, I don't even want to talk now when my life is in danger, because I don't care and I am not afraid at all." Saturday’s protest was the first time that the state television building had been broken into since the October 2000 uprising that led to the ouster of Serbian strongman Slobodan Milosevic. 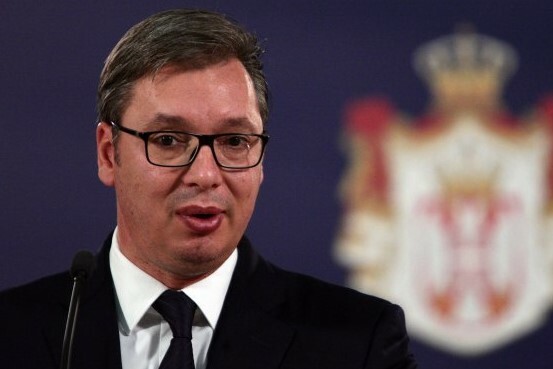 Vucic has previously said he would not bow to opposition demands for electoral reform and increased media freedom "even if there were five million people in the street".